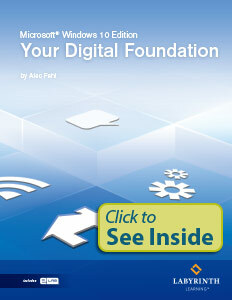 Your Digital Foundation: Key computer concepts for today’s digital world including hardware, software, networking, the Internet, file management, and more. Download a pre-publication PDF file! Log in and click the Resources tab and look for "Online Book Review PDF." Watch your students' confidence grow as they work through easy to follow, step-by-step instructions that ensure concept mastery. And the skills learned in this course will provide the core foundation needed in our ever-changing world of digital communication. Your Digital Foundation provides the knowledge and skills covered in an introductory computing courses. When combined with our Building a Foundation with Microsoft Office, it prepares them for success in both school and the workplace. Important themes--including managing digital information, school and work readiness, digital citizenry, privacy and professional conduct, and making sound technology purchasing decisions--are woven throughout the course. Searching for and managing digital information are core competencies in our digital world. We've integrated these topics with extensive coverage of searching, downloading, file compression, file management, cloud storage, and digital citizenry. We cover hardware, software, and networking concepts in a way that non-computer majors can understand and appreciate by using basic language instead of complicated jargon. Concepts are carefully written to be clear and concise. Videos are used to explain concepts in a fun, engaging way. Self-Assessment quizzes in the ebook and eLab provide immediate feedback, letting students know what they've mastered and that they need to go back and study. An ebook is included with every purchase, included the printed textbook, so all students receive engaging, interactive content. The ebook-only option os a great solution for tech-savvy students--and those on a tighter budget. The ebook engages students with interactive features such as videos, slide shows, and Self-Assessment quizzes. This solution offers true mobility. The ebook can be used in a web browser or with a downloaded application, and it adapts to any screen size on a PC, laptop, iOS, or Android mobile device. The ebook has no expiration, giving students an excellent learning and reference tool long after the course is finished. Every purchase comes with an eLab license key, our robust learning and automated assessment platform. Windows 10 is used in many of the skills activities, but we've also included coverage of iOS, Google Chrome, and other mainstream operating systems. 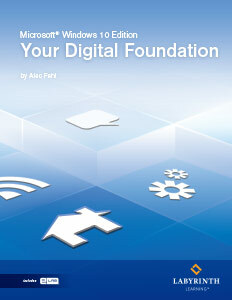 DELIVERY OPTION: This is the printed full color text plus the digital ebook. All of our titles include a set of robust instructor support materials available on the Resources tab. Students can download resources on the Learning Resource Center .